pt::peg::interp(n) 1.0.1 tcllib "Parser Tools"
This package provides a class whose instances are Packrat parsers configurable with a parsing expression grammar. The grammar is executed directly, i.e. interpreted, with the underlying runtime provided by the package pt::rde, basing everything on the PARAM. 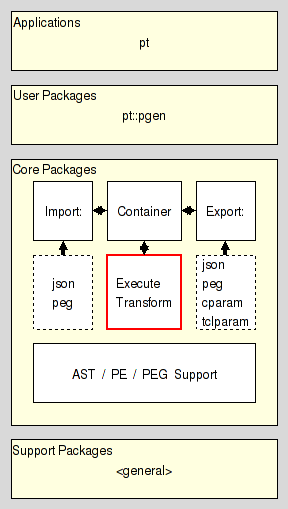 Like the supporting runtime this package resides in the Execution section of the Core Layer of Parser Tools. The interpreted grammar is copied from an instance of pt::peg::container, or anything providing the same API, like the container classes created by pt::peg::to::container or the associated export plugin pt::peg::export::container. The command creates a new parser object and returns the fully qualified name of the object command as its result. The API of this object command is described in the section Object API. It may be used to invoke various operations on the object. This new parser is configured for the execution of an empty PEG. To configure the object for any other PEG use the method use of the Object API. All objects created by this package provide the following methods. This method configures the grammar interpreter / parser for the execution of the PEG stored in grammar, an object which is API-compatible to instances of pt::peg::container. The parser copies the relevant information of the grammar, and does not take ownership of the object. The information of any previously used grammar is overwritten. The result of the method the empty string. This method destroys the parser instance, releasing all claimed memory and other resources, and deleting the instance command. This method runs the parser using the contents of chan as input (starting at the current location in the channel), until parsing is not possible anymore, either because parsing has completed, or run into a syntax error. Upon successful completion the command returns an abstract syntax tree as its result. This AST is in the form specified in section AST serialization format. As a plain nested Tcl-list it can then be processed with any Tcl commands the user likes, doing transformations, semantic checks, etc. To help in this the package pt::ast provides a set of convenience commands for validation of the tree's basic structure, printing it for debugging, and walking it either from the bottom up, or top down. The string pt::rde identifying it as parser runtime error. 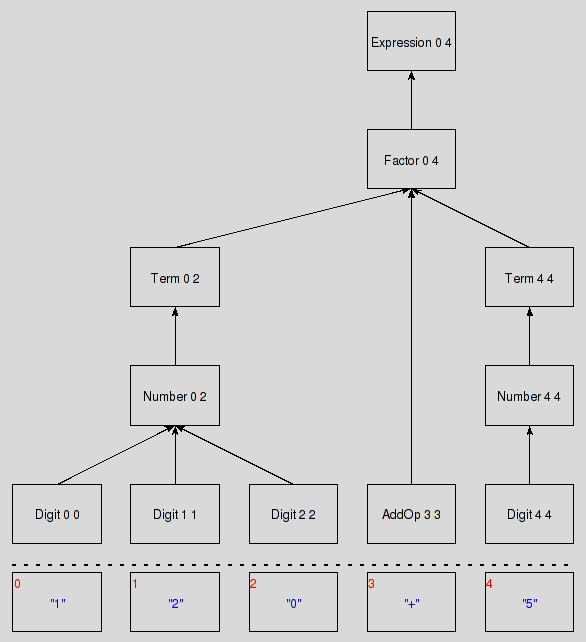 The location of the parse error, as character offset from the beginning of the parsed input. The location of parse error, now as a 2-element list containing line-number and column in the line. A set of atomic parsing expressions indicating encoding the characters and/or nonterminal symbols the parser expected to see at the location of the parse error, but did not get. For the specification of atomic parsing expressions please see the section PE serialization format. This method runs the parser using the string in text as input. In all other ways it behaves like the method parse, shown above. Here we specify the format used by the Parser Tools to serialize Abstract Syntax Trees (ASTs) as immutable values for transport, comparison, etc. Each node in an AST represents a nonterminal symbol of a grammar, and the range of tokens/characters in the input covered by it. ASTs do not contain terminal symbols, i.e. tokens/characters. These can be recovered from the input given a symbol's location. We distinguish between regular and canonical serializations. While a tree may have more than one regular serialization only exactly one of them will be canonical. The serialization of any AST is the serialization of its root node. The serialization of any node is a Tcl list containing at least three elements. The first element is the name of the nonterminal symbol stored in the node. The second and third element are the locations of the first and last token in the token stream the node represents (covers). Locations are provided as non-negative integer offsets from the beginning of the token stream, with the first token found in the stream located at offset 0 (zero). The end location has to be equal to or larger than the start location. All elements after the first three represent the children of the node, which are themselves nodes. This means that the serializations of nodes without children, i.e. leaf nodes, have exactly three elements. The children are stored in the list with the leftmost child first, and the rightmost child last. The canonical serialization of an abstract syntax tree has the format as specified in the previous item, and then additionally satisfies the constraints below, which make it unique among all the possible serializations of this tree.